Now, I loved the Stranglers, although I’ll admit I’ve no time for their post-Hugh output. For me it was all over once he left. The first post-Hugh album, In The Night, is just horrific (‘It’s in your brainbox/It’s in your dreadlocks/It’s in my red socks’) and I gave up at that point, but I’ll happily hold my hands up and say that they were a fine singles band – one of the best of the post-punk era – and they produced some classic albums. Most fans will probably go for Stranglers IV (Rattus) or Black and White, but for me The Gospel According to the Men In Black and Feline are where it’s at. I just love those two records. Fans will always argue about which album is the best (or their personal favourite) from the classic line up, but the one that will always remain on the bottom of the pile is the atrocious Aural Sculpture. Bless them, you can appreciate that they are trying to do something different, and follow up the low key and laid-back (but rather successful) Feline with an album that takes them even further away from their punk roots, but the horrible mishmash that is Aural Sculpture should never have seen the light of day. Feline was their first Top Five LP since the Raven: Aural Sculpture saw them struggle to get in to the Top 20, and of the three singles issued, only one was a reasonable hit. It would have made a great mini-album, or even EP. The collection has a couple of decent numbers, notably Ice Queen, No Mercy and lead single Skin Deep, but for the most parts it’s flabby and the addition of a horn section was a shocking mistake. It’s clear that the group are going for a more soulful groove here, but many of the lyrics are of 14 year-old schoolboy level, and nowhere is that more in evidence that the absolutely dreadful Mad Hatter. Even if you can live with the obtrusive horns, and even if the more tranquil tracks on La Folie or Feline had warned you that things were indeed changing nothing – but nothing – can prepare you for the horrendous backing vocals. Listening back to the album today, it’s actually aged pretty well, but Mad Hatter still makes me want to reach for a bucket. The group paved the way for the album with the pompous, pretentious and frankly ridiculous Aural Sculpture Manifesto, issued as a one-sided freebie with some copies of Feline and played as opening ‘music’ at live dates to promote the album. I saw them on that tour… and believe me when I tell you that it didn’t go down well with the ‘traditional’ Stranglers audience. Trivia fans might like to know that the cassette version of Aural Sculpture included a ZX Spectrum computer game, Aural Quest, which could be loaded using the Spectrum’s usual tape loading method. Anyway, see what you think. 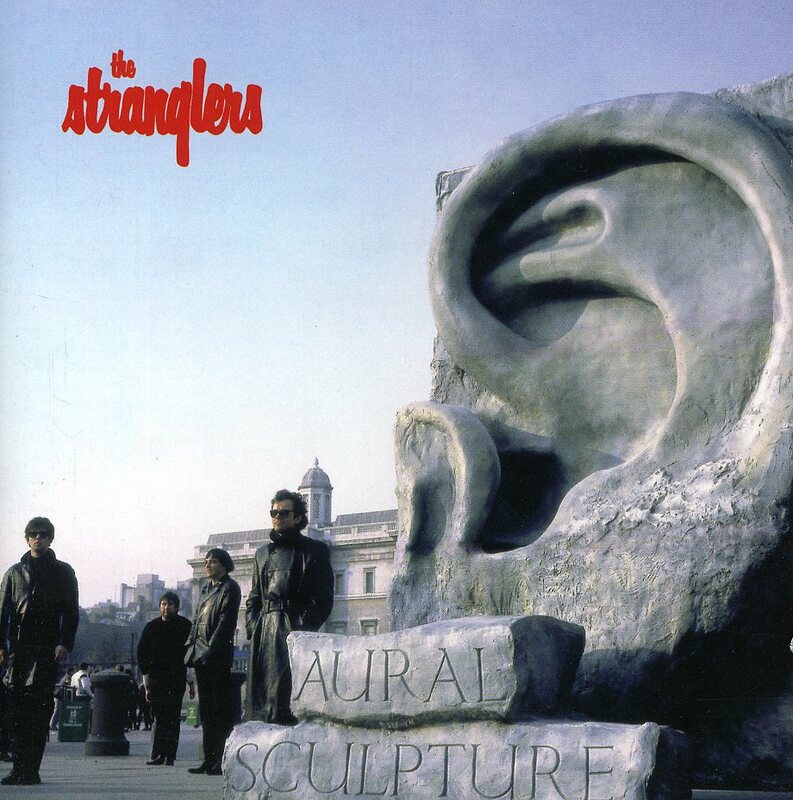 Here’s Mad Hatter and Aural Sculpture Manifesto... the nadir of the 'real' Stranglers' career. From acting and film royalty (grandfather was the great actor-manager Sir Herbert Beerbohm Tree; his uncle was the film director Sir Carol Reed), Robert Oliver Reed (13 February 1938 – 2 May 1999) was an English actor known for his upper-middle class, macho image, hellraiser lifestyle (he was close friends with, among others, Keith Moon), and tough guy roles. Although in his home country he’s best remembered for his many embarrassing drunken appearances on British chat shows, Reed was a talented actor whose appearances in several swinging 60s classics (including The System (1964), The Trap (1966), and the career-defining role of Bill Sikes in Oliver!) helped define the era. Closely associated with the films of Ken Russell - Women in Love (1969), The Devils (1971), and Tommy (1975) – he also starred as Athos in The Three Musketeers (1973), and as pervy author Gerald Kingsland in the dreadful Nic Roeg film Castaway (1986). Reed made his film debut in 1955, as an extra in the Diana Dors vehicle Value For Money. As well as making many minor (and often uncredited) television appearances over the next five years he appeared in a dozen movies, such as the Norman Wisdom comedy The Square Peg (1958), as an over-the-top camp chorus boy in The League of Gentlemen (1960) and as a nondescript teen in the cult musical Beat Girl (1960). By now he was beginning to make waves, and over the next two years would appear in bigger and bigger roles in a succession of bigger and bigger hits: he played a bouncer in The Two Faces of Dr. Jekyll for Hammer, the leader of a gang of Teddy Boys in another Wisdom film, The Bulldog Breed, an artist in the Tony Hancock comedy The Rebel and as Lord Melton in Hammer Films’ Sword of Sherwood Forest. Good looking in a brutish sort of way, naturally the record companies soon came a-calling. 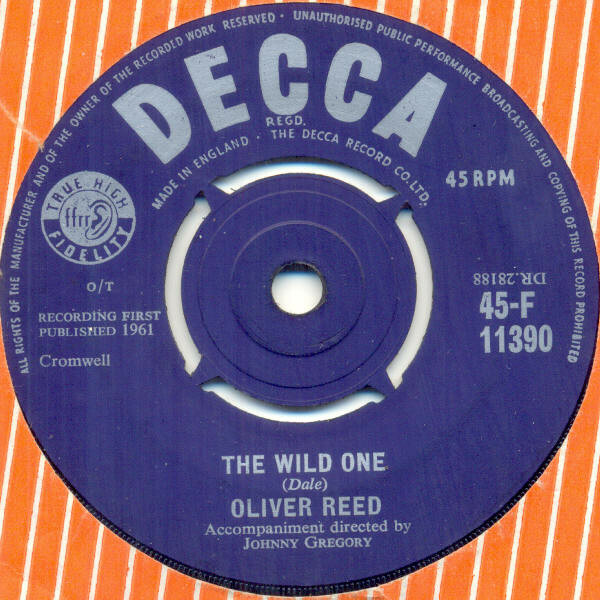 Ollie first stepped in to a recording studio in 1961, laying down two tracks for a Decca single: the Jim Dale-penned The Wild One (a song he would perform, drunk, on TV in the 80s), and Lonely For a Girl. Both are excruciatingly awful: the production and arrangement of The Wild One owes a great deal to Joe Meek (and, in turn, owes a lot to Buddy Holly), but that’s about the only thing the plug side has going for it. The B-side is worse: Ollie can’t hit the notes, and the little spoken interlude is diabolical. Wonderful! Was written by Mitch Murray who would go on to write How Do You Do It, recorded by two groups from Brian Epstein’s stable. On both tracks Reed sounds uncannily like another of Decca’s singing stars, Jess Conrad. The Decca single sank without a trace. Unperturbed, Reed’s management hustled him over to Pye, where he cut a couple of sides for their Piccadilly imprint: Sometimes was written by Dave Clark and Ron Ryan (the Dave Clark Five were signed to Piccadilly around the same time), while the B-side – Ecstasy – was a cover of the song written by Phil Spector and Doc Pomus, and first released by Ben E. King. If anything, its worse than the Decca 45. Next was a dreadful ‘comedy’ cover of Baby It’s Cold Outside, sung as a duet with Joyce Blair… who, of course, would go on to release Christine – a novelty single inspired by the Profumo affair - under the pseudonym Miss X. Ollie only appeared on the A-side. That was it. 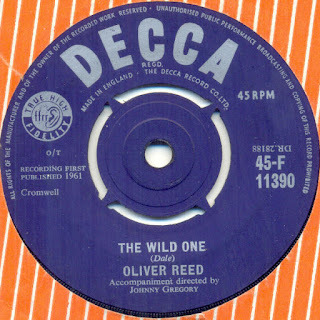 He would appear on the soundtrack to the movie Oliver!, and as the narrator on a version of The Ancient Mariner, but no more pop singles would be issued under his name until the 1990s, when he released a horrible version of the Troggs’ classic Wild Thing, a recording that even featured a guest appearance from snooker legend Alex ‘Hurricane’ Higgins. But by that time he had become better known for falling over drunk and insulting women on chat shows than for his acting ability. Starring roles in shockingly bad movies such as A Touch of the Sun (later re-released as No Secrets!) did nothing to improve his lot, although his reputation was somewhat salvaged with his final on-screen appearance, as Antonius Proximo, the gruff gladiator trainer in Ridley Scott's Gladiator. Released posthumously, Reed would be nominated for the BAFTA for Best Actor in a Supporting Role. Here, for your delectation, are all five of Ollie’s stabs at 60s pop stardom. Gillian Anderson: actor, activist, writer… pop star? Released in 1997, Extremis was Gillian’s only credible stab at the pop charts. The actor met musical collective Hal when Gillian narrated BBC documentary series Future Fantastic. Hal - a quartet that included house producer Pascal Derycke, Duncan Lomax – a.k.a Savage - Padi Staid and Raheem, the stage name of the late Paul Gallagher – produced the soundtrack for the series and Gillian let it be known that she would like to work with them. Extremis, built around a tune the musicians had already composed for the title sequence, was the result. A union of liquid and virtual flesh. Automaton love, your caress is pneumatic. I'm a slave to your touch, my response automatic. It’s elision. My emotions drift. Two of the band appeared with Miss Anderson on TV to promote the single. 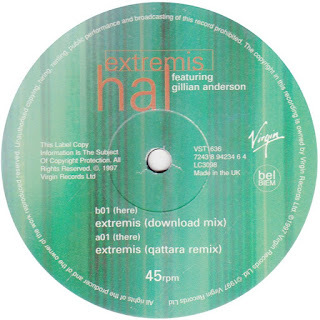 As Gillian told it: ‘I don’t sing [but] Virgin was interested in doing something if I put down some sort of vocal something… it’s their music and I just kind of slipped in and put down a few words.’ The original release featured four different mixes of the same song. Thankfully the team decided not to reunite for a follow up, although Anderson did compile a double CD of electronica, which featured the track as well as other music by Brian Eno, Harold Budd and others. Released at the height of X-Files mania, Extremis made the UK Top 30 and, apparently, did rather well in a number of other countries. It was denied the Number One spot in Greece by the Spice Girls. Derycke, as Halspirit, is still making ambient music today. ‘We had a lot of fun, and that, basically, is what this has been about,’ Gillian told Rodrigo Stecher of Axcess magazine. ‘It’s not about me putting out a single, and it’s not about me and my song, and it’s not, “Hey, look at me, I have an album,” you know? It’s got nothing to do with that. It was just an idea that expanded and expanded and we have a little song. I did not for one second feel that this is the beginning of a pop career, nor do I want it to be.’ I like her attitude. As there's only one track today, I've also included the video. Time for some classic outsider madness! Norwegian legend Arvid Sletta has issued nine albums to date. The latest, Fast And Slow, is credited to Arvid Sletta and his regular collaborators Anders Sinnes and Oddbjørn Tvervåg, and was released earlier this year. Sinnes and Tvervåg are accomplished musicians, and their sheen adds an interesting polish to his work, but I prefer the oddball earlier works, all solo and all utterly mad. Born in January 1960, Sletta began his music career in the mid 1980s in the band Easy Riders with his brothers Reidar and Øyvind. The band – according to Wikipedia, anyway - issued one 45 (Call Me Tonight/You Drink Too Much) and two cassette-only collections Brilliant Kind Of Works (1988) and In Love (1990), although they all appear to have been incredibly limited. However you can find much of their output on YouTube, if you search for 'Easy Riders (Frøya)'. The band split in the early 1990s, by which time Arvid had already issued his debut solo album. His music has been featured in the short films Size 5, No Coke, Statement Too (a documentary about Arvid which was dong the international Film Festival circuit a couple of years back) and Little Red Hoodie. Here are a couple of tracks from his rather wonderful early work, his debut LP Statement and second album Name. Issued in 2005, a full 15 years after Statement, Name features 31 tracks, many of them under a minute in length and only two over two minutes long. 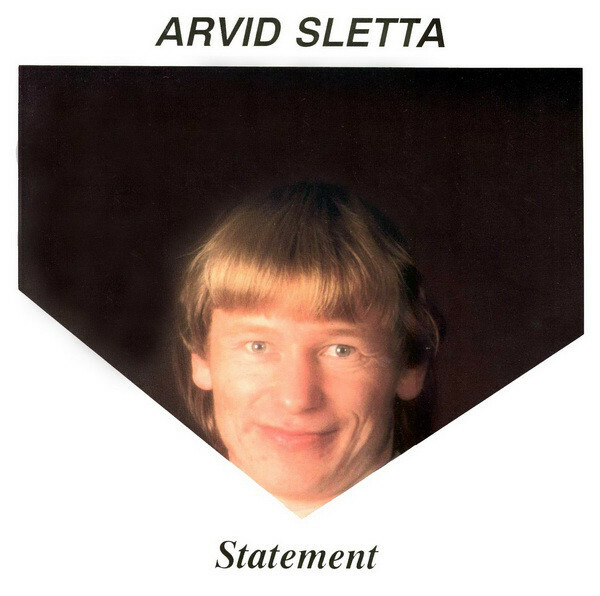 Statement is the only one of Arvid’s albums to appear on vinyl, all of the others have been self-published on CD. If you want more there’s plenty on YouTube, Spotify and iTunes for you to discover. A rogue, a cad… immortalised on the silver screen in countless iconic roles, including the brilliant Addison DeWitt in All About Eve (for which he won an Academy Award), married to a Gabor, the voice of Shere Khan, Batman’s Mr. Freeze… George Sanders was a true star. Russian-born but raised in Britain and of aristocratic stock, Sanders and his family fled to Britain in 1917. He began his career on the stage in musicals, after his friend Greer Garson suggested he take up acting. Prior to that he had run a tobacco plantation and worked in advertising. His first recording, Regency Rakes, was from the 1934 production of Noel Coward’s Conversation Piece. He appeared in several British movies during the 30s, but it was when 20th Century Fox cast him as the villain in Lloyds of London that sanders started to attract attention. Lloyds of London was a big hit and Fox put Sanders under a seven-year contract. His first leading role came the next year, in Lancer Spy. Next he was cast as The Saint in a series of movies, and began a successful association with Alfred Hitchcock, appearing in both Rebecca and Foreign Correspondent. When RKO, the producers of The Saint series fell out with author Leslie Charteris, they created the role of The Falcon for Sanders. He bore a striking resemblance to his elder brother, Tom Conway (real name Thomas Charles Sanders), and the latter was often cast in Sanders-esque roles. Conway took over the role of The Falcon from his George, the two of them appearing together in that film. The only other time they appeared together on screen was in Death of a Scoundrel (1956), in which they also played brothers. Tom Conway died, of alcoholism, in 1967. His career never reached the same heights as his brother, but like him he had also worked for Disney, voicing two minor characters in 101 Dalmatians. Released in 1958, The George Sanders Touch is not the worst singing actor album you’ll hear, but it is still awful. 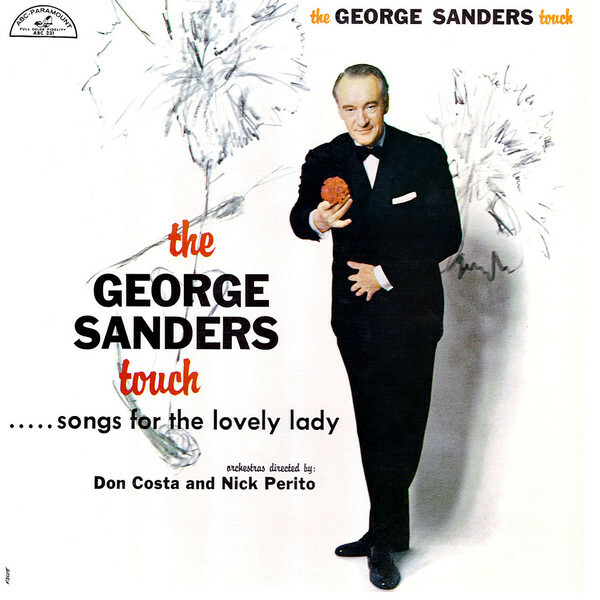 The lush orchestrations – by Nick Perito (who was closely associated with Perry Como for much of his career) and Don Costa (best known for his work with Sinatra and Paul Anka) – are gorgeous, but Georgie boy is out of his depth. His bass-baritone croon is ok, and he just about gets away with it on Try A Little Tenderness, but his range is severely limited, as you can hear for yourself on the dreadfully out-of-tune As Time Goes By. It’s all downhill from there. He murders September Song, one of my favourite songs, with a ridiculous (and, frankly, obscene) spoken word intro that lifts him in to the stratosphere that will later be occupied by Barbara Cartland. Rather appositely he performs If You Were the Only Girl In The World, massacred by Dame Babs herself on her Album of Love Songs. The song Such Is My Love, was composed by Sanders himself. Sanders’ last role was in the low-budget British horror movie Psychomania (released in the US as The Death Wheelers), which hit cinemas in 1973. Here’s George crooning a couple of tunes. Enjoy!